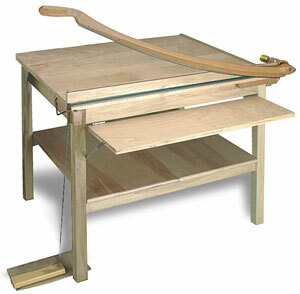 GBC Classiccut Ingento Maple Table Trimmers offer a heavy-duty cutting assembly mounted on a sturdy wooden table with a drop shelf and a storage shelf below. With Holddown Bar — A foot-operated hold-down bar keeps edges straight and fingers away. Dimensions are 36" × 30" (91 cm × 76 cm). The top is scored for easy measurement and alignment of papers. Packed flat, easily set up. Some assembly required. Without Holddown Bar — Same construction as the larger 36" × 30" table, but slightly smaller, and without the foot-operated hold-down bar. Dimensions are 30" × 30" (76 cm × 76 cm). The top is scored for easy measurement and alignment of papers. Packed flat, easily set up. Some assembly required.